I wish that I could meet you in person, chat about books across our easy chairs, and serve you a plate of the potato salad I just made. You wash and boil the potatoes until they are only slightly soft. Peel them when they’re cool. Layer them thinly sliced with the onions, oil and vinegar. salt and pepper. You chill the bowl when it’s all prepared; when you serve it, and eat it, you know that summer has finally arrived. Find more weekend cooking here. That sounds so good. My grandmother did something like that with cucumbers. Well, I think she didn’t put oil in it, but vinegar, salt, pepper, green onions. Fresh cucumbers from the garden. Yum! Love your mother’s saying! What could be better than something fresh from the garden? The rabbits in our neighborhood get to these things before we do! I love a Vietnamese salad with cucumbers and vinegar (and I’m not sure what else); your grandmother’s dish makes me think of that. We do eat our memories, don’t we? This sounds and looks so simple and delicious. I think I’ll make this the next time we all get together as a family. It is not hard, only a bit time consuming. If you do make it, remember to layer potatoes, vinegar and oil, salt and pepper, green onion, then more layers upon layers. It’s even better the next day when the flavors have melded. If you do make it, let me know. Yum – I like the sound of this one! Lighter and more refreshing than the American version! I need to get back to cooking again. This sounds like an easy enough recipe that even I couldn’t mess it up…and tasty to boot. Of course, the sentiment conveyed in your opening sentence sounds pretty good as well! Haven’t met one I don’t like…I’m even fond of sweet potatoes nowadays. Yes, I’ve acquired a taste for sweet potatoes as well these days – I never used to like them. Beautiful presentation. Cheers from Carole’s Chatter! Bacon? In a potato salad? Truly? Ours always included some mayo, but I’ve honestly never heard of bacon being included. 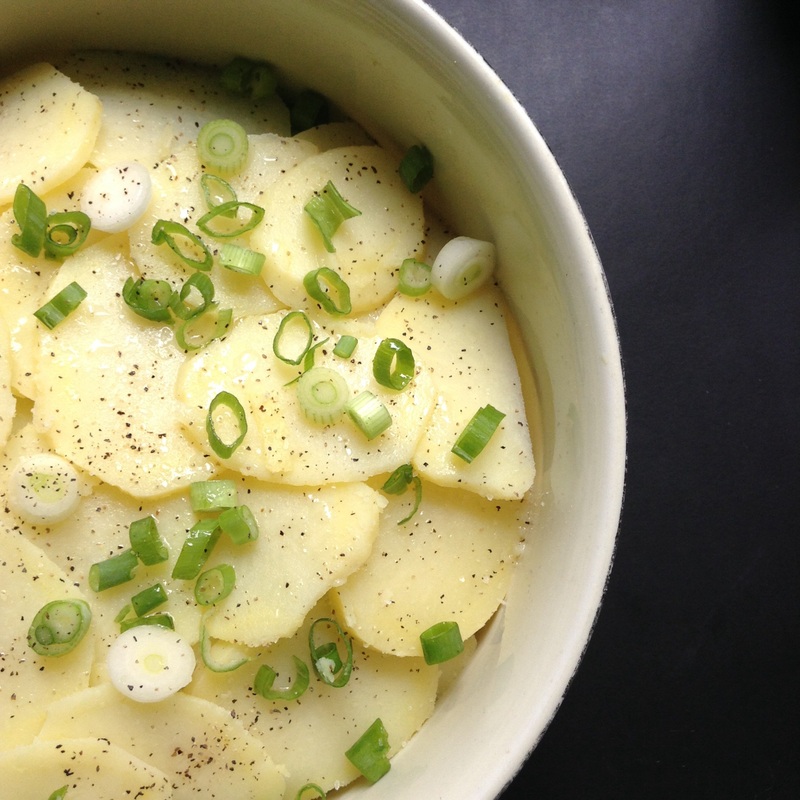 Regional language variations have nothing on regional potato salad variations! Yours sounds wonderful, and well worth a try. I have seen some with bacon, you know, for the full fat effect. Love your thought that regional language variations have nothing on regional potato salad variations! It’s so true, and I think each person is particularly fond of their own (perhaps childhood?) recipe. I remember the first time I tasted German potato salad, with vinegar and bacon and sugar I think was somehow in there, and the whole thing was thoroughly nauseating. But, an American salad with too much mayo is equally nauseating to me. Hope you do try this, it’s so good. Looks like a healthy, low fat version. Something I can try. Looks delicious. I’m reading The Stones Cry Out by another Japanese author, Hikaru Okuizumi. I haven’t heard of the Stones Cry Out, nor its author. Thanks for filling me in! I hope you can review it for the Japanese Literature Challenge 9 beginning (officially) on Monday? Hooray! I’ve added you to the list of participants on my welcome post. This sounds like something similar to what I do but with dill in it, possibly some grain mustard. Served with fish. Yours looks good & food is a fantastic way to evoke memories. Oh, I love dill and grain mustard; they would be wonderful additions, I think, although I’ve really only used dill with fish. And a spicy carrot dish we love. Sometime, I should write a post about food and memories…I have to put it together in my mind, but it is an interesting topic for many of us. That sounds delicious! Might be just the perfect side dish to go with some grilled salmon. My potato salad recipe is made with a mix of mayo, sweet pickle relish, cooked egg yolk and mustard. I love it, but it’s not terrible good for me, so I only make it once or twice a year. I hope you’re having a lovely start to summer. We’ve been enjoying the rain-free weekend and hope to get out on our bikes this afternoon. Every weekend has been rain-filled here in Illinois. I am not complaining because the gardens look so lush, and my classroom is blessedly cool. But, it does prohibit bike riding. Glad you’re doing some for me! Really, Yukon Gold potatoes would be good any darn way they were cooked. My mom makes a mean potato salad. While my Gram’s potato salad is indeed made with bacon and mayo, it’s not summer until I’ve made and eaten an unseemly amount. Every bite reminds me of her. I miss her. My mom’s potato salad has so many other vegetables in it, I’m not sure why we call it potato salad. Sprinkled with dill, dab of mayo optional; I love it. Your version sounds delightful — I’m going to try it. A beautiful, simple, and healthy recipe. Thank you, Bellezza! I’m a fan of the American style potato salad I must admit, but this does sound like a healthier alternative. I love the lightness of this! I’m not at all a fan of mayo. I think I’ll give this version a try!